Surfing Lessons at Adventures Outdoor Activity Centre01656 782300workSurfingPorthcawl offerS some of the best beaches for surf lessons and surfing holidays in South Wales. Often referred to as the Wales Gold Coast and only 20mins from Cardiff. At our Activity Centre we offer a range of surf lessons and surfboard hire to individuals, groups and schools looking for beach lessons in South Wales. Porthcawl offerS some of the best beaches for surf lessons and surfing holidays in South Wales. Often referred to as the Wales Gold Coast and only 20mins from Cardiff. At our Activity Centre we offer a range of surf lessons and surfboard hire to individuals, groups and schools looking for beach lessons in South Wales. 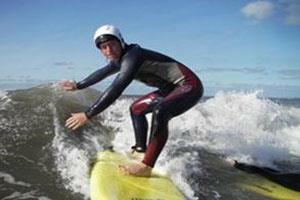 Surfing lessons here at Adventures Wales provide the best induction, to what can be a difficult sport. As a measure of our surfing instructors success, the majority of people taking surfing lessons achieve stand up surfing in their first day. Surfing Lessons can be as formal or informal as you wish within our safety rules. Great activities for schools, youth groups and stag and hen weekends.